Teixeira, F. P., Gomes, O. F. M., and Silva, F. A. (2019). "Degradation mechanisms of curaua, hemp, and sisal fibers exposed to elevated temperatures," BioRes. 14(1), 1494-1511. The influence of elevated temperatures on mechanical behavior was studied for curaua, hemp, and sisal natural fibers. Tensile tests were performed on fibers heated at 100 °C, 150 °C, and 200 °C for 24 h, and reference samples were maintained without thermal treatment for comparisons. The cross sectional area of the fibers was measured using a scanning electron microscope (SEM), and the image analysis was performed using the open source software Fiji/ImageJ. These data allowed the computation of the tensile stresses and the correlation of the fiber morphology with its macro-mechanical behavior. The thermal degradation behavior of the natural fibers was measured via thermo-gravimetric analysis (TGA) and X-ray diffraction (XRD). The morphological and mechanical characteristics were described and discussed on a microstructural basis. The results showed that the loss of moisture leads to a significant increase in tensile strength before reaching the limits of the degradation range. Research on the addition of natural fibers to engineering materials has been widespread, seeking environmentally friendly and energy-efficient solutions. Natural fibers are particularly interesting reinforcing components for composites, as they are biodegradable, harmless to the environment, and economically more viable than synthetic fibers. Therefore, the mechanical, morphological, and durability characteristics of fibers such as abaca leaf, cotton, curaua, flax, hemp, jute, sisal, etc., have been investigated (Kicińska-Jakubowska et al. 2012; Komuraiah et al. 2014; Yan et al. 2016). Because these fibers are natural materials, they present morphological variety, which directly influences the tensile strength ​​and Young’s modulus. Disparities among measured values may be associated with the production efficiency, natural conditions, extraction methods, and processing conditions of the fiber. These variations in the mechanical behavior can be described by morphological characteristics. The morphologies of curaua and sisal fibers have been evaluated, correlating their mechanical properties via image analysis (Fidelis et al. 2013). These fibers presented tensile strengths greater than 249 MPa and Young’s moduli greater than 19 GPa, classifying them as high-performance fibers. The highest tensile strength was observed for curaua, at 543 MPa with a Young’s modulus around 64 GPa, followed by sisal, at 484 MPa and 19 GPa, respectively. The correlation of morphology (by the real cross-section) with the mechanical properties showed that as the internal area of the lumens decreases and the secondary cell wall thickness increases, the fiber strength and Young’s modulus increase. Analysis of the influence of stem sampling area on the mechanical properties of hemp fibers showed that fibers from the middle of the stem exhibit the greatest ultimate strength and elongation, with the Young’s modulus around 19 GPa and the tensile strength not exceeding 500 MPa (Duval et al. 2011). Compared to bottom and top sampling areas, the ultimate tensile strength differences were approximately 23% and 18%, respectively. Liu et al. (2015) showed that hemp fibers from the middle section also exhibited the best mechanical performance, presenting the highest ultimate tensile strength and strain of 842 MPa and 5.7%, respectively, and a moderate stiffness of 28.8 GPa. Fibers from the top section showed moderate mechanical properties, with an ultimate tensile strength of 809 MPa, a strain of 4.7%, and the highest stiffness, of 31.5 GPa. The variation in mechanical properties of fibers with stem section is explained by the differences in morphological features and composition. In natural fibers, thermal degradation involves two main steps. The first is the thermal depolymerization of the hemicellulose and the cleavage of glycosidic linkages of cellulose. The second is related to the decomposition of the α-cellulose. The decomposition of lignin occurs at temperatures between 200 °C and 500 °C (Manfredi et al. 2006). In derivative thermogravimetric (DTG) analysis of sisal fibers, the decomposition starts at 215 °C, the decomposition of the hemicellulose happens at 290 °C, and the maximum degradation rate occurs during α-cellulose decomposition at 340 °C. Yao et al. (2008) analyzed the thermal decomposition process of 10 types of natural fibers, included wood, bamboo, agricultural residue and bast fibers. The thermal decomposition process resulted in a similar TG and DTG curves due to being lignin cellulosic material. It was noticed an onset decomposition temperature about 215 °C for most of the natural fibers and weight loss in this range was observed around 5%. The maximum decomposition rate of main natural fibers happened about 290 °C, except for maple and pine (an average of 310 °C). These same ranges of decomposition were also presented by other authors (Yang et al. 2007; Collard and Blin 2014; Ovalle-Serrano et al. 2017; Yu et al. 2017). The thermal characterization of sisal fibers by thermogravimetric analysis (TGA) presented a mass loss of approximately 3% from 30 °C to 220 °C, attributed to water loss in fibers (intramolecular and intermolecular dehydration reactions) (Martin et al. 2009). The fibers’ degradation begins around 250 °C and continues quickly as temperature increases, having a mass loss of 72% at approximately 420 °C. Due to the slow decomposition of residues, the mass loss from 420 °C to approximately 520 °C is only 5%. After 520 °C, the ash content is around 20%. The thermo-mechanical behavior of hemp fibers at temperatures between 20 °C and 200 °C showed an activation of their visco-elastic properties, corresponding to relaxation of the constituent polymers (hemicellulose and lignin), and decreases in rigidity and endurance, attributed to thermal degradation of the cellular walls, at temperatures between 150 °C and 180 °C (Placet 2009).The literature presents extensive results about the thermal degradation of cellulose-based structures, especially through thermo-gravimetrical analysis, showing indices of moisture loss, decomposition and maximum weight loss until reaching the limits of the degradation range. However, such analyzes do not represent how these levels of thermal degradation can truly influence the mechanical behavior of exposed natural fibers. The present work investigated the mechanics of three different natural fibers (sisal, curaua, and hemp) and how elevated temperatures can influence their mechanical behavior. The morphologies and cross-sectional areas of each fiber were measured using a scanning electron microscope (SEM) and an image analysis routine. The different fibers were tested under direct tension before and after being exposed at 100 °C, 150 °C, and 200 °C. The mechanisms of degradation were explained through TGA and X-ray diffraction (XRD) analyses and by microstructural observation. The curaua fibers were provided by the Pematec Company (Santarém, Pará, Brazil). The fibers were obtained in the Amazon region, extracted from the Ananas erectifolius plant by the mechanical process of decortication (Silva et al. 2008; Fidelis et al. 2013). The hemp fibers were obtained from Unipak A/S (Galten, Denmark), which manufactures skeins made of natural hemp for the plumbing industry. The sisal fibers were obtained from farms located in Valente, Bahia, Brazil. They were extracted from the leaf of the Agave sisalana plant by the same process used for the curaua fiber. All the fibers were first treated with hot water (approximately 70 °C) for 1 h. This procedure aimed to eliminate the maximum amount of impurities retained on the fiber surface. Thereafter, the fibers were air dried for 48 h.
For the tensile tests, the dried specimens were arranged according to ASTM C1557-14 (2014) with gauge lengths corresponding to 20 mm. The fibers were fixed in kraft paper tabs (140 g/cm²) and then heated at 100 °C, 150 °C, and 200 °C for 24 h. Reference samples were maintained without thermal treatment (room at approximately 22 °C and 60% relative humidity) for comparison. The specimens were subjected to tensile loading performed in a servo hydraulic MTS 810 system with a 100 N load cell and an external LVDT (MTS, Eden Prairie, MN, USA) to achieve greater accuracy in data acquisition. Fifteen specimens of fiber were tested for each group (reference, 100 °C, 150 °C, and 200 °C) and the tensile tests were carried on under displacement control at a rate of 0.1 mm/min. All tests were performed at room temperature (approximately 22 °C) with a relative humidity of approximately 60%. The fiber microstructure was investigated using an FEI Quanta 400 scanning electron microscope (Thermo Fisher Scientific, Hillsboro, OR, USA). 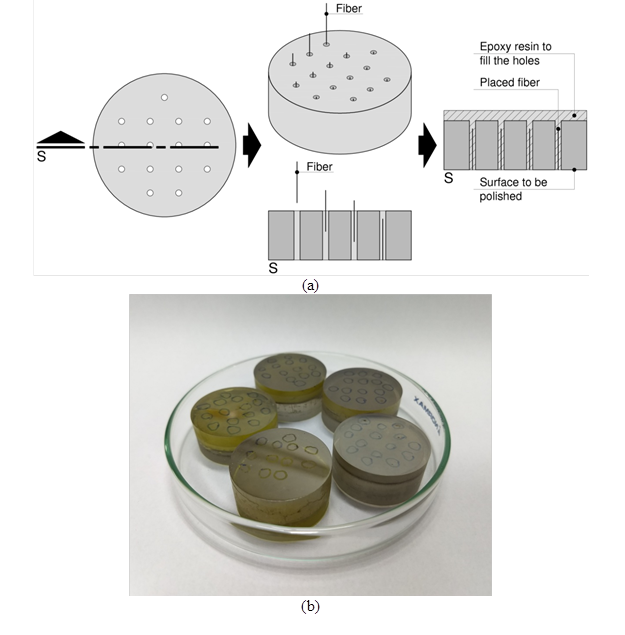 For the dimensional analysis, the samples were prepared by cold embedding in epoxy resin (Gomes et al. 2018). A solid resin block 30 mm in diameter and approximately 12 mm in height was drilled with a 1.5 mm diameter drill to create 15 holes, in which 10 mm length fiber samples were carefully placed, as illustrated in Fig. 1(a). Thereafter, the holes with fibers were filled with more epoxy resin, and a vacuum pump was used to ensure no bubbles were formed during its curing. After curing, the block was ground and polished in an automatic polishing machine (Struers Tegramin 20, Cleveland, OH, USA). The grinding was performed with 125 µm, 40 µm, 9 µm, and 6 µm sized diamond-particle-impregnated metal discs, for 3 min, 4 min, 4 min, and 10 min, respectively. Then, the blocks were polished using 3 μm and 1 µm diamond suspensions for approximately 20 min each to produce a high flatness surface. Subsequently, the blocks were covered with evaporated carbon to become conductive, as shown in Fig. 1(b). This preparation procedure can provide a suitable contrast in SEM images to analyze the fiber microstructure. The image analysis was carried out using the open source software Fiji/ImageJ (Schindelin et al. 2012; Schneider et al. 2012). A contour line was interactively drawn to delineate fiber cross-sections, and their areas were then measured. The thermogravimetric analysis (TGA) was performed under N2 atmosphere, from 25 °C up to 500 °C, using a TA Instruments (New Castle, DE, USA) SDT Q600. Approximately 10 mg of each sample was used, and the analysis was conducted at a heating rate of 5 °C/min. where CI is the crystallinity index of the material, Ac is the area of crystalline peaks, and Aa is the area of amorphous halo. In order to evaluate the statistical significance of CI variations, the two-sample t-test was used as the statistical method. The parameter α = 0.05 was set as the risk level in all statistical analysis, and p < 0.05 was considered to be statistically significant. Hierarchically, in a simplified way, a single natural fiber is formed by several microfibers that have their cell walls (primary cell wall and secondary wall divided into three layers around the lumen) constituted by a series of helically wound cellular microfibrils formed from cellulose molecules (Zimmermann et al. 2004; John and Thomas 2008; Wegst et al. 2015). The studied fibers showed different morphologies when analyzed by dimensional parameters. The geometries of the cross sections were also distinct, and these variations were related to the quantity, size, and organization of the microfibers. Table 1 summarizes the morphological characteristics of the curaua, hemp, and sisal fibers. The cross section of the curaua fiber (Fig. 2(a)) presented a star shape with area around 0.006 mm² and a large amount of microfibers in its structure, approximately 404 per section, the greatest amount of microfibers among the three species studied. These microfibers presented an average area of 18 μm² and cell wall thickness of 1.6 μm, the smallest area and cell wall thickness of microfibers among the three species studied. The hemp fiber (Fig. 2(b)) showed the smallest area among the three fibers, measuring 0.002 mm², and could not conclusively be associated with a specific form due to their average amount of microfibers per section being around 11, which together showed a relatively uniform geometry of agglomeration. However, their microfibers presented an area around 224 μm² with the cell wall thickness around 6.2 μm, the largest among the three fibers studied. The sisal fiber showed the largest cross section area, compared with curaua and hemp, measuring 0.030 mm². The sisal fiber (Fig. 2(c)) presented an arched shape (Silva et al. 2011), with approximately 228 microfibers, measuring about 137μm² in area with a cell wall thickness around 2.9 μm. Fidelis et al. (2013) also investigated the morphological characteristics of curaua and sisal fibers, as showed in Table 2. Some of these results, such as the amount of microfibers per cross section, presented a wide variation: a reduction of 97% and 39% for curaua and sisal, respectively. However, even with this large rate difference, the cross-sectional area results can be considered close. These variations can be explained by the morphological disuniformity presented by the natural fibers structure, which provides different characteristics, including the mechanical ones, due the influence of the morphology variation of fibers from stem’s top, middle and bottom (Duval et al. 2011; Liu et al. 2015). When exposed to thermal treatments, the fibers showed different levels of degradation. The curaua and hemp fibers (Figs. 3 and 4) exposed at 200 °C presented delamination of the microfibers, with the weakening of the middle lamellas visible, especially in the hemp fibers that suffered total bond collapse. The sisal fibers (Fig. 5) at 200 °C showed the greatest thermal resistance and did not show any signs of weakening. The high thermal resistance of sisal in comparison to curaua and hemp can be explained by the amount of hemicelluloses—curaua and hemp have hemicellulose amounts around 20% to 23% (Komuraiah et al. 2014; Ferreira et al. 2015b; Yan et al. 2016) but sisal only 10% (Sydenstricker et al. 2003; Silva et al. 2008)—which is responsible for most of the thermal degradation behavior of natural fibers (Beg and Pickering 2008; Ornaghi et al. 2014). The TGA of curaua, hemp, and sisal fibers showed similar patterns of weight loss (Fig. 6). Up to 100 °C, the samples showed a moisture decrease, represented by a weight loss of approximately 9%, and then stabilized from that point to 200 °C. From there to approximately 290 °C the hemicellulose degradation occurred and thereafter the thermal decomposition of cellulose remains up to approximately 350 °C, as also presented by many other authors (Alvarez and Vázquez 2004; Manfredi et al. 2006; Martin et al. 2009; Krishnaiah et al. 2017). At this point, the thermal degradation caused weight losses of 78%, 67%, and 72% for curaua, hemp, and sisal, respectively. Over 450 °C the continuous weight loss is due to oxidation of remnant carbon (Ovalle-Serrano et al. 2018). According with DTG analyses, the maximum weight loss was observed at 329 °C for hemp, 336 °C for curaua, and 342 °C for sisal, which is consistent with that observed in the XRD analysis where sisal fibers also showed higher thermal stability, probably due the lower content of hemicelluloses when compared to curaua and hemp fibers. The range from 100 °C to 200 °C by TGA and DTG showed no significant changes occurring with these fibers (beyond those already shown up to 100 °C). The XRD analysis of curaua, hemp, and sisal fibers was performed for the reference and 200 °C treated samples, and the deconvolution of crystalline peaks and amorphous halo was performed in the range of 5° to 60° (2θ). The highest intensity peak in all cases was noticed at 2θ between 22.0° and 22.6° reflection assigned to the (002) crystallographic plane. The average intensity peak was observed at 2θ between 14.5° and15.3 ° (101), with the lowest intensity peak at 2θ between 33.9° and 34.1° (040). Only the hemp samples presented prominent peaks at 2θ between 15.9° and 16.2° . These results are compatible with other analyses about the crystalline structure of cellulose (Park et al. 2010; Poletto et al. 2014; Ferreira et al. 2015a; Diaz et al. 2016). The peaks at 2θ from 33.9° to 34.1° (040) were not included in the deconvolution analysis due to their very low intensity (Diaz et al. 2016) (Fig. 7). Table 3 presents the natural fibers’ crystallinity indexes. Comparing the reference fibers with those exposed at 200 °C, the CI presented increases of about 3%, 4%, and 4% for curaua, hemp, and sisal, respectively. The crystallinity degree of cellulose is directly related to the rigidity and flexibility of the natural fibers: their rigidity increases, and flexibility decreases, with increasing ratio of crystalline to amorphous regions (Poletto et al. 2014). In this case, however, the CI increases at 200 °C probably were associated with the loss of humidity (at 100 °C). For curaua and sisal fibers, this difference in crystallinity index values between the reference and 200 °C samples was not statistically significant, as described by the p-values in Table 4. However, the hemp fibers presented p < 0.05, which indicates there was statistical significance concerning its variation.